Meeting the last Wednesday of every month the Endometritis Support group raise awareness of, and offers support to women suffering from this often debilitating condition. All meetings for this year will be held at :- Wednesfield Community Centre, Wednesfield Library, Well Lane, Wolverhampton. Meeting run from 7-9pm and are open to sufferers and their families. Anyone who wishes to join the group or wants more information can do so in several ways. Log onto Endometriosis Uk website and search for group. Locate Black Country support group and fill in the online form. Alternatively they can email them at endosupport.blackcountry@live.co.uk or search Endometriosis UK Black Country Support Group and request to join, it is a closed group for women with endometriosis. People can also follow us on twitter @Endoukbc. We know that anything to do with periods can be considered a taboo subject but it is important that we raise awareness about this condition that so many suffer from. 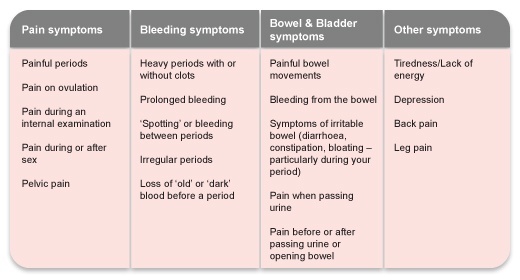 The below table of symptoms to give you an idea of what these women have to deal with. Endometriosis doesn’t just affect a woman during menstruation it can also affect her in between periods.